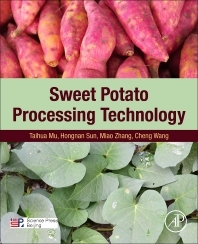 Sweet Potato Processing Technology systematically introduces processing technologies of sweet potato starch and its series products including sweet potato protein, dietary fibers, pectin, granules, anthocyanins and chlorogenic acids. The book provides a detailed and comprehensive account of physicochemical and functional properties of sweet potato products, the nutritional components extracted from sweet potato, as well as their utilization in food, medicine and cosmetic fields. This book can provide the scientific basis and technical support for virtuous circle promotion and structure upgrade of sweet potato processing industry. This book will be a valuable reference for undergraduate and graduate students, as well as specialists and enterprise research staff in the field of food technology. Prof. Mu’s research expertise includes physicochemical, functional and nutritional properties of potato and sweet potato components; comprehensive utilization of potato and sweet potato byproducts; application and industrialization of ultra-high pressure food processing technology for food protein; application of bioactive peptides produced from potato and sweet potato. Prof. Mu has presided over and participated in more than 50 projects in National High-tech Research and Development Program (863 Program), National Scientific and Technological Support Project, scientific and technological achievements transformation for Ministry of Science and Technology, and corporate cross-cutting project, etc. He has obtained 10 CN patents, and published 86 peer-reviewed journal articles and 12 books. His projects ‘Study on recovery technology and functional properties of sweet potato protein from starch processing wastewater’ and ‘Study and demonstration of recycling technology of sweet potato starch processing residues ’ won the prize of achievement from Chinese Academy of Agricultural Science and Technology in 2010 and 2013, respectively.